There are a myriad of flavours to enjoy along the Murray River. Too numerous to mention in fact. So here's a taste of what's possible on your Murray River experience. Since the early days of irrigation in the 1890s by the Chaffey Brothers, the Murray River has been the food bowl of Australia. Large irrigation schemes have allowed an abundance of local produce to be grown and shipped all over the world. The Murray River and surrounds has now become one of Australia's most important primary production regions. The climate of year-round sunshine coupled with innovative irrigation has made this the land of plenty. 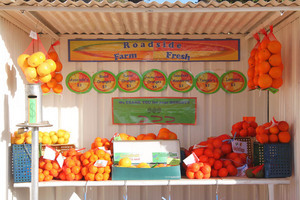 One of the best ways to discover the flavours, character and diversity of the region are the local farmer's markets. The community feel, the fresh local produce, foods baked and prepared with a load of passion and love. Stefano is a Murray River Tourism ambassador and a member of the Slow Food Movement, an international association that promotes wine and food culture.